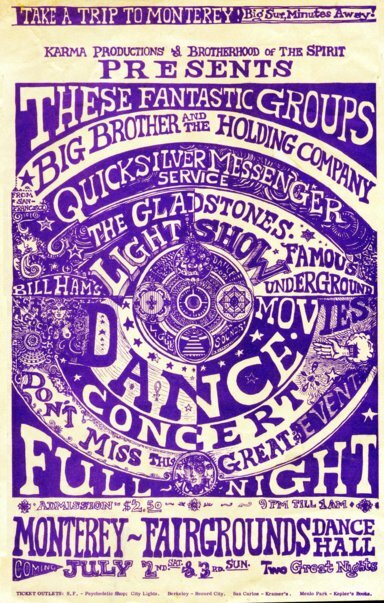 Robert Ronnie Branaman: "My poster for a Dance Concert, Monterey Ca., 1966. A year before the Pop Festival. We promoted the Dance Brotherhood of the Sprit, Susan and I; Karma Productions, Sam Most who did most of the real work. My band was The Gladstones (our motto "we're glad we're stoned" ) It was a trip and hanging with Janis Joplin and housing the Band, for 3 days. Her singing blew us all away. Neal Cassady and Allen Ginsberg were attendant." August 2009. Also see: Chances "R" drawing, by Robert Ronnie Branaman, April 1967 & San Francisco Oracle No. 9, backcover by Robert Ronnie Branaman, August 1967. Poster © 1966-2009 Robert Ronnie Branaman, used with permmission, all rights reserved; page © 2009 George Laughead, maintainer, Beat Literature, Open Directory Project. Page posted: 01 September 2009. Hosted at WWW Virtual Library @ www.vlib.us.